Last year I read all six of Sara Donati's Wilderness series books. The first was 'Into The Wilderness'. You'll find my review of it here. This, and the books that followed it are my all time favourites. So, having fished around on various blogs and seeing what Google would spit out at me, I thought I knew all there was to know about them. I came across a review that mentioned Sara Donati had taken some characters from 'The Last of the Mohicans' and written a sequel. 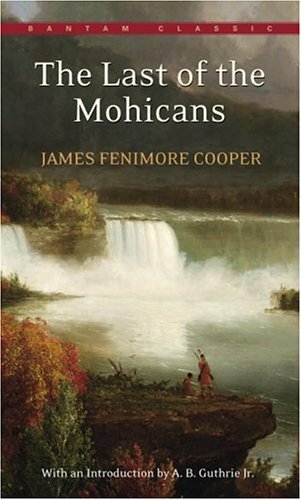 Dumbfounded, I trotted off to the library and asked one of the friendly staff to fossic in the bowels of the building for a copy of James Fenimore Cooper's novel. Inside the rather dusty and tattered pages I found theses characters: Cora, Nathaniel (aka Hawkeye) and Chingachgook. Now in 'Into the Wilderness' Hawkeye and Cora's son is one of the main characters - Nathaniel Bonner. Cora has passed away and Chingachgook meets his demise early on in the book. Fascinated by this discovery, I found a copy of the movie - The Last of the Mohicans. I remember watching it when it came out almost 20 years ago. Daniel Day Lewis made his name and I was shocked at the blood shed. This time around I was stunned by the beautiful forests. And the more I watched the more intoxicated I became at the scenery, the depiction of the town of Albany, and the scene where they hid behind a waterfall. Although I noted that it was shot in North Carolina, not up state New York, Sara Donati's books came alive. And it got me wondering if it was Cooper's book that had inspired her or the wonderful cinematography of the movie. Either way, she wrote awesome books. If you haven't read her books, I urge you to try them. Maybe you might like to revisit an old movie too. And James Fenimore Cooper? Well, I had to return the book before I'd finished it. Written in 1826 it was hard going, but one day I aim to give it justice. 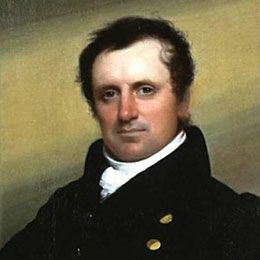 James Fenimore Cooper - the man who started it all. It sounds like Donati wrote a sequel to the movie rather than the book. I haven't seen it, but I've been told about the plot and it is entirely different from the book. I don't want to give you spoilers for the end since you haven't finished it, but I can say that Hawkeye was certainly not the romantic lead - he functioned almost as a supporting character in the book. No love interest, definitely not Cora. :) Anyway, I'd definitely recommend the book. (I also understand the movie killed off a few more characters who survive in the book). Elisabeth - thanks for the info. I'll get back to the book one day. A Certain Book - Too many books, not enough hours!